d-c-home | Trendy natural stone look: marble rocks! Trendy natural stone look: marble rocks! Marble, stone and iron break… A tradition going back as far as the cult German song from the 1960s is the use of marble, an elegant natural material, as flooring or on walls to create a sophisticated look in older houses or real luxury villas. But if you are thinking that marble is old news – think again! Not only has marble and the decorative use of marble looks made a stylish comeback in recent years, it is currently a trendsetter when it comes to adding a touch of luxury to your own home. A classic: the side table, often also found in varying sizes as part of a set – given a refined, updated look with elegant accessories in copper, gold and brass shades. You can quickly and easily add this touch of luxury to your own home! 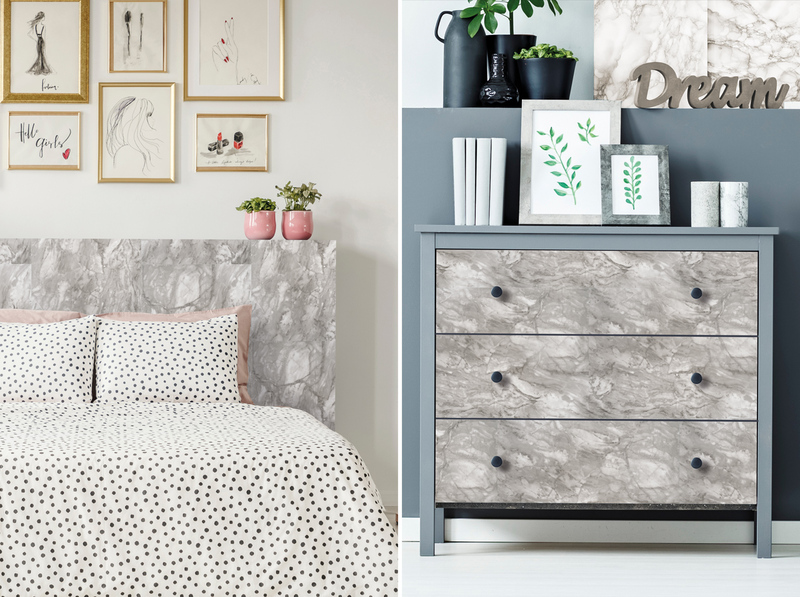 Give your wooden or metal side table the ultimate luxurious style update with the new, chic d-c-fix® marble romeo decorative film in a striking marble, silver look. Want even more elegance? How about a marble-look coffee table for your living room? To achieve this look, simply create a simple, quadratic base out of MDF or laminated wood and cover it with the new marble romeo film. Shelves or a large serving tray in the same look will go perfectly with your new coffee table. And if your desk or dining room table has taken a few knocks around the edges, you can transform it into a unique piece with the chic marble-look design film. For an effortless luxurious look – that weighs a lot less than the real thing! Clever, right?